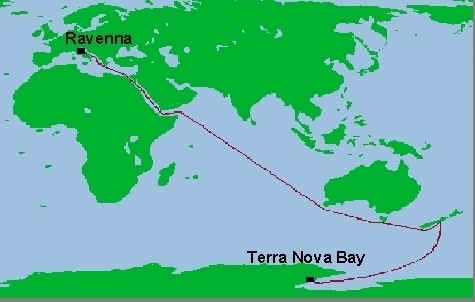 During the 1996-97 austral summer, a 3NM-64 neutron monitor was operated on board the ship "Italica" of the Italian Antarctic Program to record cosmic ray neutron intensities in ocean areas from Italy to Antarctica and back. Two bare BF3 counters also measured the flux of thermalized neutrons. The main purpose of this research was the determination of an accurate latitude curve of cosmic ray nucleonic intensity during solar minimum to be used for obtaining the coupling function appropriate for this phase of solar cycle. Accuracy was achieved through reliable instrumentation, proper control of the experiment and by determining and applying for the first time all corrections, for (i) changes in vertical atmospheric mass column, by taking into account wind effect; (ii) oscillations of the ship produced by sea roughness; (iii) atmospheric temperature changes; (iv) primary cosmic ray temporal variations including North-South asymmetry; (v) and, temporal variations in the cosmic ray East-West effect, caused by asymmetric shielding on the ship. (a) The quality of the NM data recorded during the survey has been controlled in detail; the instrumental stability of both monitors has been successfully verified by calibrations with the Rome 17NM-64 before and after survey, and by internal tests conducted during the expedition, including ratios among individual counters' intensities, multichannel pulse analyses, etc. (b) Intensity data have been accurately corrected for a number of meteorological effects, including the effect of atmospheric mass variations, ship oscillations and atmospheric temperature changes; the absorbing atmospheric mass has been estimated by barometric data taking into account the wind effect and the local value of gravitational acceleration. (c) Intensity data have been corrected for changes in the primary CR flux, including North-South anisotropy. (d) The NM corrected data, recorded along the same route during forward and return trips, i.e. with temporal separation and in different meteorological conditions, are statistically consistent within (1-1.6)s ; a small systematic discrepancy is observed in the rigidity interval Rcp~(9-11) GV. In section 4 we showed that this effect could be attributed to the asymmetric shielding of the monitor (Forward-Backward effect). Owing to its small amplitude, we eliminated this effect by averaging the forward and return data. (e) Cut-off rigidities have been computed by taking into account the penumbra effect for vertically incident particles, for the 1995 geomagnetic field model extrapolated to the survey period and by using, as a first approximation, flat coupling function in the penumbra region. To maximize accuracy it is necessary to compute the apparent cut-off rigidity thresholds Rcp,ap, by taking into account the contribution of non-vertically-incident primary particles in the actual geomagnetic field and evaluating the penumbra effect for the actual coupling functions. For computing such relatively small effects we used, as a first approximation, a simplified algorithm adapted for a dipole geomagnetic field. Rcp,ap-Rcp was found to be negligible for Rcp<5 GV and to increase up to 0.5 GV at Rcp~16 GV. (f) We note that in our survey the penumbra effect is particularly important in the Northern Hemisphere. 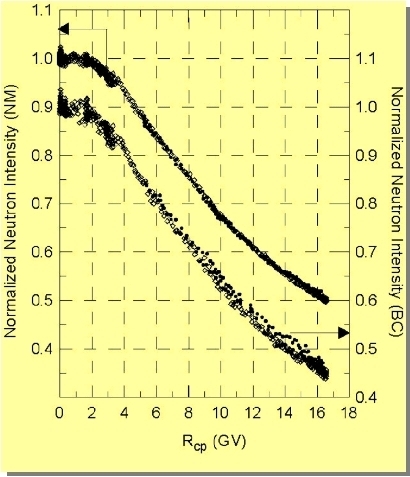 The BC detector, which is sensitive to thermalized neutrons, should have a larger response function for primary particles arriving at large zenith angles, as compared with the NM. In this case the weights of penumbra and Forward-Backward effects are expected to be more relevant for the BC, as indicated by a large discrepancy between the Northern and Southern Hemisphere and a remarkable Forward-Backward effect. (g) The measured NM latitude curves in both hemispheres are equal within statistical limits. (h) The NM coupling function, computed using data recorded in Southern Hemisphere covering the whole rigidity interval, can be reliably used for the data of the sea-level NM station network during the past solar minimum. (i) We applied the same procedure for BC detector and computed the coupling function for the thermalized neutron flux in the atmosphere at sea level. As far as we know, this is the first detailed evaluation of such a coupling function: the BC detector on the ocean is found to respond to somewhat lower energy particles than NM detector, as expected. We point out that this coupling function can be used for a BC operating on the ground provided that the different contribution of radioactivity (from sea water to ground) is taken into account.